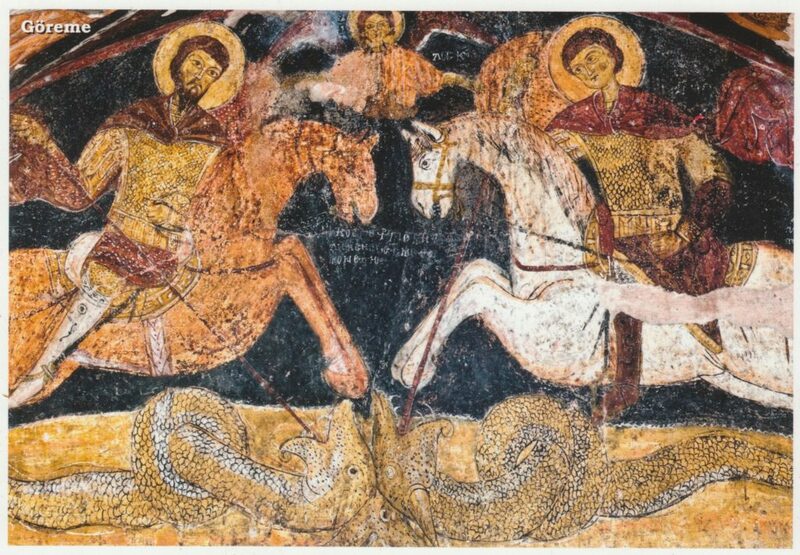 The formal reason for my trip to the Middle East was that I wanted to investigate the convergence between the Christian St. George, the subject of my doctoral dissertation, and al-Khidr, a revered Muslim wali usually identified as the righteous guide of Moses in Sura 18 of the Koran. I do have some things to say about this convergence although I am still preparing my thoughts. In the meantime, allow me to share some St. George discoveries. • Yesterday, a package arrived from Turkey that I had sent to myself. It looked like someone had taken a baseball bat to the box, but the contents were surprisingly undamaged. Among them was a postcard from Cappadocia, and a guidebook for the Göreme Open Air Museum. 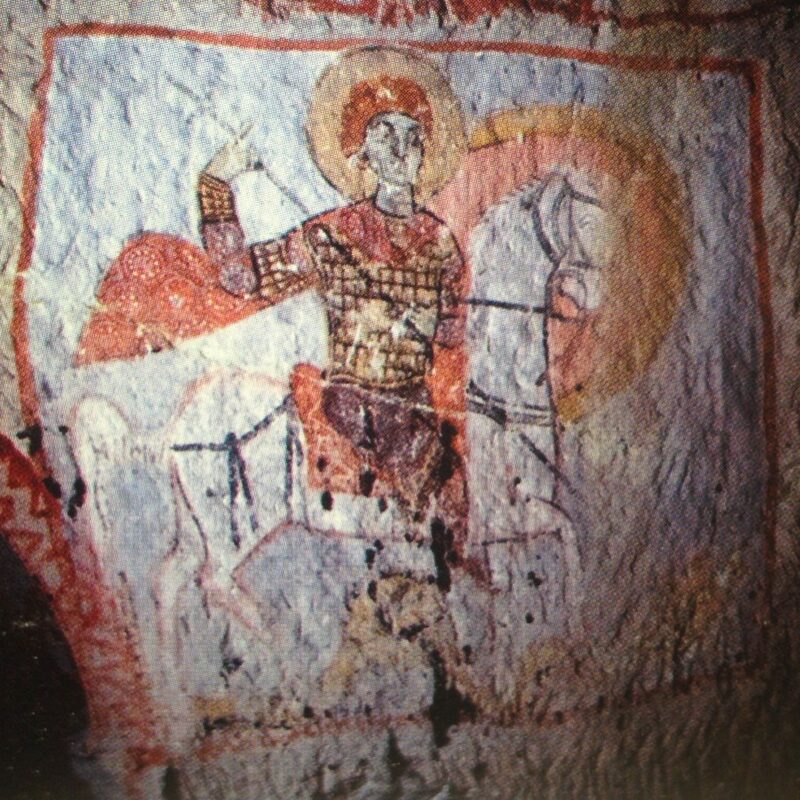 It seems that in Cappadocia, St. George was frequently twinned with St. Theodore, his fellow warrior saint and equestrian dragon slayer. 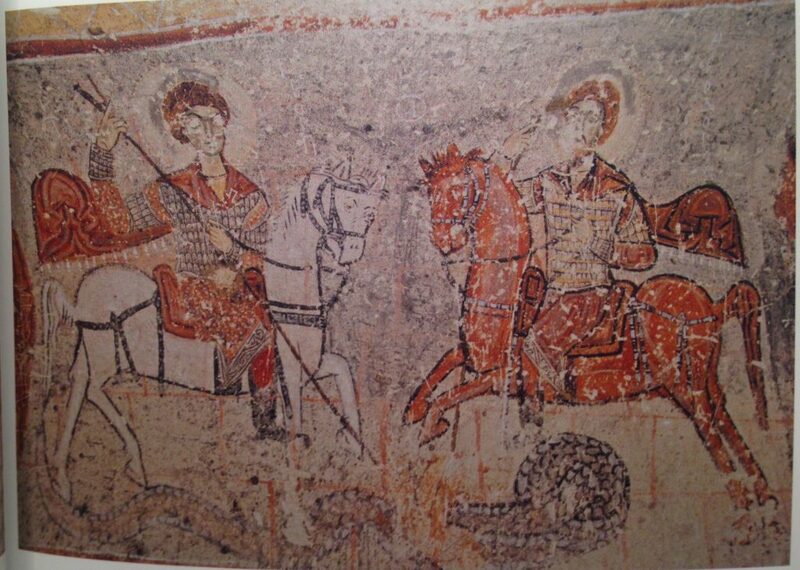 The way to tell them apart is that St. George rides a white horse, while St. Theodore’s is red. In the image below George is on the left, and Theodore on the right, but both saints kill the same dragon, which is a nice instance of teamwork. On account of the dragon, the church where the painting appears is named Yılanlı Kilise (“Snake Church”) – although its original dedication was to St. Onuphrius. From Murat E. Gülyaz, Göreme Open Air Museum (Istanbul: Secil Ofset, n.d.), 49. A simple and handsome portrait of a single St. George, in the Chapel of St. Basil. I like how his horse gets a halo too. From Murat E. Gülyaz, Göreme Open Air Museum (Istanbul: Secil Ofset, n.d.), 40. 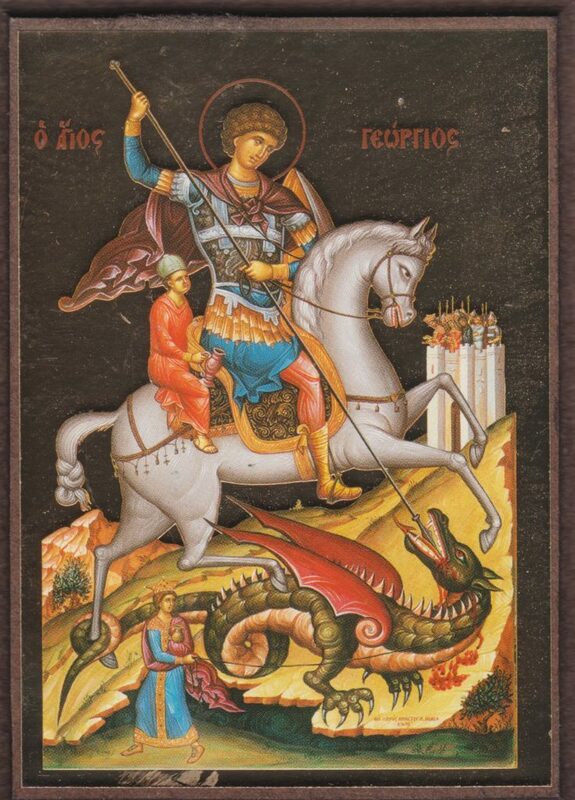 • I have seen a lot of icons of St. George, but before this trip I had never seen one of St. George, riding his horse, slaying a dragon, watched by the princess… and with a little man riding on his horse with him. 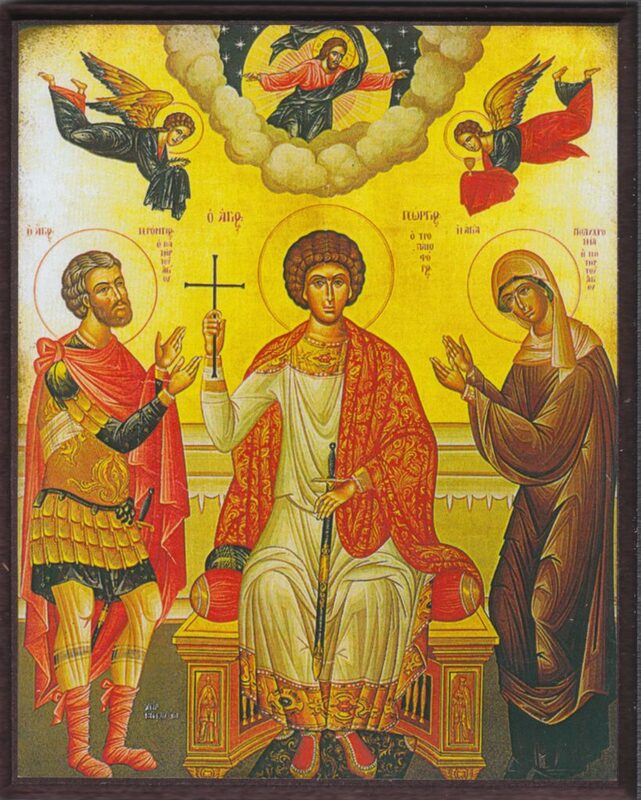 During their invasion of Paphlagonia the Agarenes (Moslems) took many people into captivity, among them a young boy who was a servant in the church of St. George in Phatris. Some of the prisoners were killed, the rest turned into slaves. The boy was of such beauty that he was chosen as a servant for the Arabian ruler. As he rejected the offer to become a Muslim, he was sent to work in the kitchen. 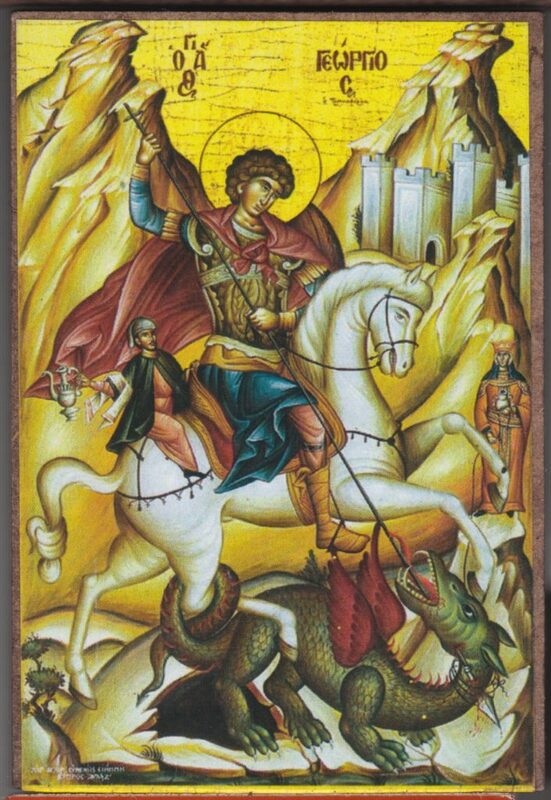 In his misfortune the poor boy prayed to Saint George. Once at evening, when he was lying in bed, he heard a voice coming from the yard and calling his name. The boy opened the door and saw a rider who caught him and placed behind himself on the horse. Then the steed rushed forward and started to gallop. The rider brought the boy to a certain building, and then disappeared. The exhausted youth fell asleep and next morning was awakened by the people, who were dismayed because his Arabian clothes suggested the presence of enemies. The boy recognised those people as monks. As it transpired, he had been brought to Monastery of St. George. All of them went to a church to offer a thanksgiving prayer to God for saving the youth. Behold, when ye are entered into the city, there shall a man meet you, bearing a pitcher of water; follow him into the house where he entereth in. And ye shall say unto the goodman of the house, The Master saith unto thee, Where is the guestchamber, where I shall eat the passover with my disciples? And he shall shew you a large upper room furnished: there make ready. And they went, and found as he had said unto them: and they made ready the passover. In other words, a man bearing a pitcher will lead the way to the site of a miracle – in the Gospels the Last Supper, in the icons the destruction of evil, represented by the dragon. 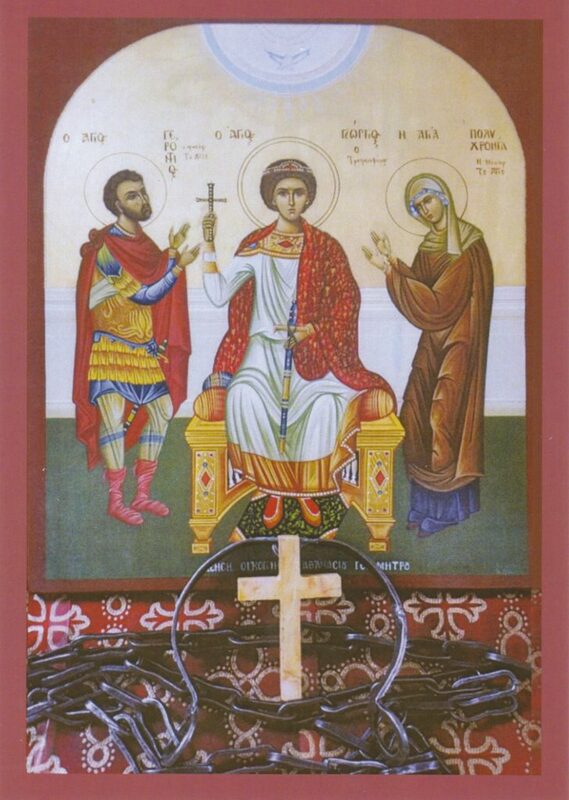 • Finally, another novel image for me: St. George seated between his parents, St. Gerontios and St. Polychronia. You know that a saint is important when he starts to be supplied with relatives – who are themselves saints by association. Their names, respectively meaning “Old Man” and “Woman of Many Years,” suggest that they were later inventions. The fact that his father was from Cappadocia, and his mother from Lydda, may also be seen as an attempt at explaining one of George’s place-designators, and the location of his principal shrine. More on St. George to come! 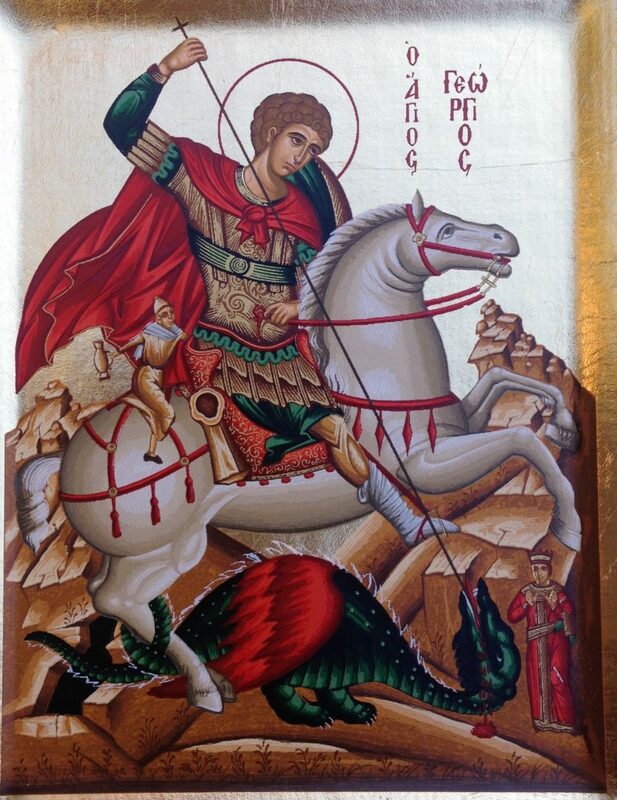 This entry was posted in Jerusalem, Saints, St. George, Travels, Turkey by jgood. Bookmark the permalink.